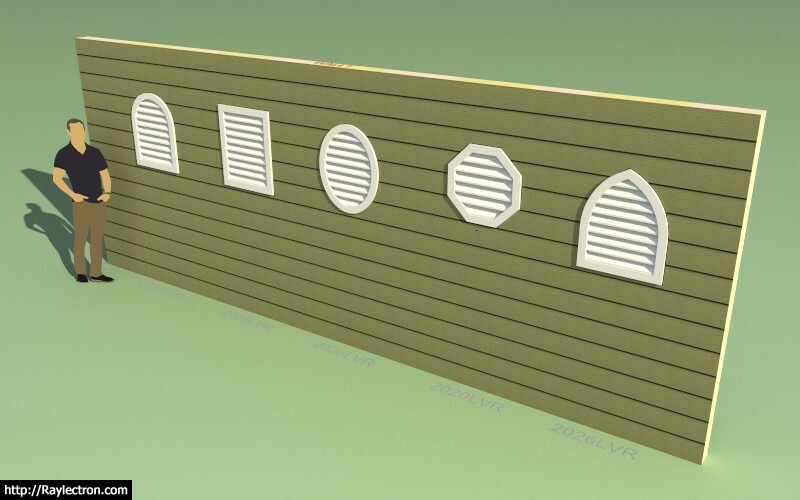 Louver vents are really nothing more than removing the sash and glass from a window assembly and replacing them with slats. 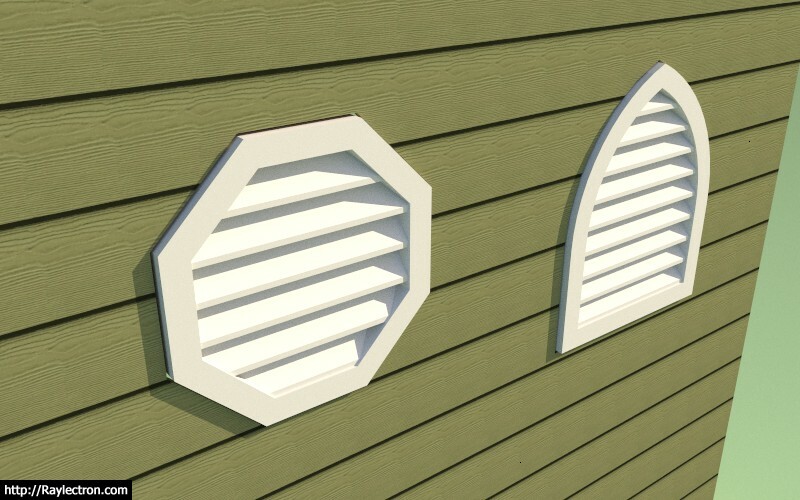 Exterior trim around the louvers can also be applied (the same as regular windows). Hopefully this will be another small source of revenue to help offset my recent decision to skip out on subscription licensing. I am also excited to be able to provide some recognition to those who have been instrumental in the development of these plugins. If you feel like you should be included as one of the development or finanicial sponsors please contact me via email. Each sponsorship includes a listing with your logo, name (individual or company), a short paragraph explaining your business, credentials, products etc... and a link to your website. The same sponsors section will be shown at the bottom of all three plugin pages. I am also open to suggestions on how to make this feature/listing more attractive to potential sponsors. After some discussion on stairs today and giving it some more thought it did occur to me that one could pre-assemble some more common stair configurations with the plugin and then at a later time simply copy and paste these into a new or different models. The inserted stairs (groups) can then be edited just like any other stair assembly created from scratch in the model/file. If anyone notices any problems with this strategy please let me know. I've looked around for some relatively lightweight electrical outlets and switches to use as the default components in the new electrical module. Unfortunately, everything in the warehouse is too complex or high poly count for my liking. I will also create a series of low poly switches. The electrical boxes are dimensionally accurate and are models of the Carlon Blue PVC boxes. The faceplates are per the specs sheets from Leviton standard face plate sizes. When I get some extra time I will add in more options for boxes and face plates. I'll start with the standard US/Canadian NEMA receptacles. Within the global settings the user will be able to set which country's electrical standard they wish to use. Yet another plugin within an already beautiful plugin. The plugin suite is not only increasing in depth but becoming very broad as well. The best is yet to come. My goal this year is to hopefully bring on some extra programming help so I can further accelerate the development and eventually get to the engineering (my piece de resistance) modules. Just loaded the Wall Plugin into SU 2019 and so far all is good. I did notice that the HTML menus seem to be loading quite a bit faster and the performance overall seems to have improved. It looks like the browser engine under the hood has been updated and already there is a marked improvement, thank-you SketchUp. When you drag a menu and then select a drop down box the bug where the drop down opens up at the previous location is now resolved. Looks like I might have to update to SU 2019. - Added a trimmer extend option to extend trimmers up to bottom of header when a built-up header is used that has a bottom plate. In certain jurisdictions the trimmers (jack studs) must extend to the bottom of the actual header and not to just the bottom plate of the built-up header. This option allows one to set this per window and also within the global settings. The toolbar bug is probably more apparent to Mac users but technically also affects Windows users as well. - Added logic to the final assembly routine to allow for electrical components (Medeek Electrical) to be retained within wall panels. 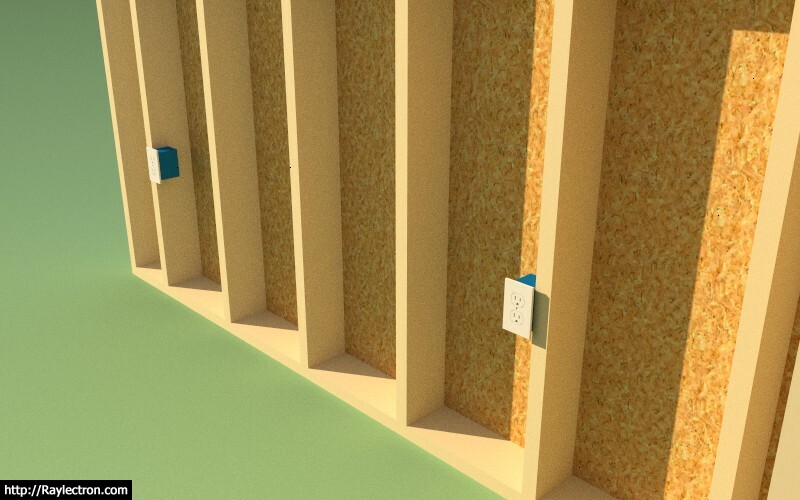 Previous versions of the Wall plugin will not be compatible with the new Medeek Electrical plugin. You will be able to create electrical components but as soon as you rebuild or modify a wall it will blow away all of your electrical components. It might be useful to have a button somewhere in the global settings that allows one to reset all of the settings to the initial installed settings, essentially reset the entire plugin with a single action. I think a few settings such as the serial number one would not want to reset. Option to have window labels on interior of building instead of exterior? Scalability of openings' labels within LayOut? Door & window schedules from Medeek wall assemblies to LayOut? I’ve been giving some thought to potential customers of the plugins and based on what I am seeing so far I think there is a definite pattern. Most, if not all, of the plugin purchases are made by customers who are already SketchUp users versus new users who are converting to SketchUp because of the plugins. For a designer/architect to convert to SketchUp (and the plugins) is a very difficult and big decision for them. It involves changing their entire workflow and possibly a major disruption in their revenue and output. I personally still have not fully made the switch from AutoCad to Layout. For a designer who is already using SketchUp as their primary design tool it is a much smaller hurdle to incorporate the plugins into their existing SketchUp workflow. For many of these users the plugins offer an incremental increase in productivity and efficiency even if they are not fully parametric or still have certain limitations. For a new user who is converting to SketchUp from some other software the bar is much higher and as a result the chances of a conversion is quite low in my opinion. Also these new users are looking for a turnkey solution and not a plugin ecosystem that is still in the process of development. Another hurdle is the fact that Layout is no where to the level that it needs to be for many designers (I just spoke to another designer in Canada who puts the majority of his dimensions directly on the model rather than trying to work inside of Layout). The Layout issues will impact the adoption of the plugins, there is no doubt about it. That being said I think the people most likely to purchase the plugin suites will be current users of SketchUp who have already integrated SketchUp into their workflow and understand its limitations and advantages. They will accept the plugins even in their imperfect state simply because they already are substantial enough to increase a designers efficiency and save them considerable time. Once the plugins are fully parametric, with the ability to handle complex roofs , complex foundations, gable/shed walls and a number of other improvements, then we might begin to see some people actually convert from other design software packages. I do not think that many will convert to SketchUp on account of a plugin suite that is still far from finished. I have been giving the backer boards at T-intersections some serious thought for a while now. I’ve resisted adding them in primarily because there is such a variation in the way this is handled. Some use the U-shaped structure (3-studs). Others will run two studs flat. Yet another common method is ladder blocking between nominal studs. I will be adding in a “blocking module” for the inserting of custom blocking into the wall panels, there has been quite a bit of requests for this. However, automating T-intersections (blocking) would probably be preferential to manually having to go back and insert the blocking. Another ongoing issue is the Material Manager in the Global Settings locking up for Mac users. This issue has to do with the behavior of modal HTML windows and MacOS. I am still working on the resolution. This problem does not affect users who are running on Windows. I'm thinking about adding in a "Header Manager" that allows the user to basically create and manage their various headers for doors, windows and garage doors. Glulam headers will still be a special case situation which will not be managed by this interface. The only road block I'm running into with this is I have an issue with MacOS and the show modal incompatibility. I still have not determined the resolution to this problem which is affecting the Material Manager in the global settings. The look and feel is somewhat similar to the material manager, but it may evolve further as we go. I've set it up so that metric and imperial libraries are stored in completely separate files. 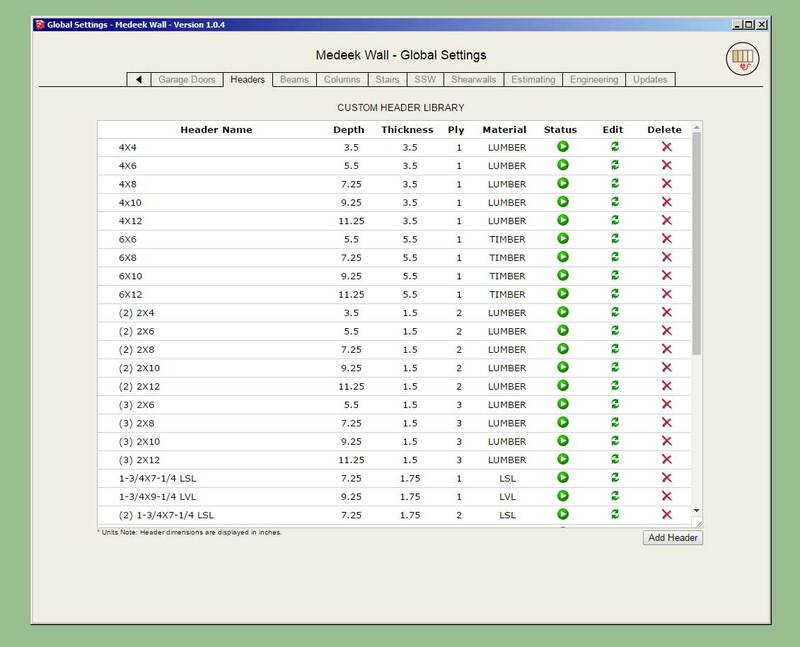 Each library is loaded based on the currents units of the model. This allows one to maintain two distinct header libraries, one for imperial sizes and one for metric sizes. Metric header sizes (dimensions) will be displayed in millimetres, imperial in inches. Names or the description may include spaces as shown. There are five basic parameters for a given header: name, depth, thickness, ply and material. The ply is limited currently to 1,2 or 3. There are other more exotic header configurations (ie. foam sandwiches etc...) however this update will at least allow the user to create their own custom sized headers. P.S. This is a fairly major change in the plugin which affects a lot of elements (doors, windows, garage doors) and a lot of menus (global settings, draw and edit). As such it will probably take me another day or two to make sure that I've updated everything affected by this change and it all works well together. Another thing worth noting is that if you create a wall with a given header name (eg. 4X4) and then delete that header from your library, on purpose or even accidentally then the plugin will no longer be able to complete a lookup on that particular header name. If the plugin cannot find the header name in the library it will simply default to a 6x6 timber header by default. The purpose behind this behavior is that you can then go into the global settings update/edit a particular header and then regen your walls and they will update with the new parameters for the updated header. I will be creating a new toolbar within the Wall plugin that will be called Medeek Documents. This will be the start of the Scenes/Layout piece of the mdkBIM package. Eventually I will pull this out of the Wall plugin since it will be similar to the Medeek Estimator in that it will eventually work with roofs, floors and foundations and not just wall panels. The first icon will allow the user to select various assemblies and generate corresponding scenes that can then be utilized within Layout. 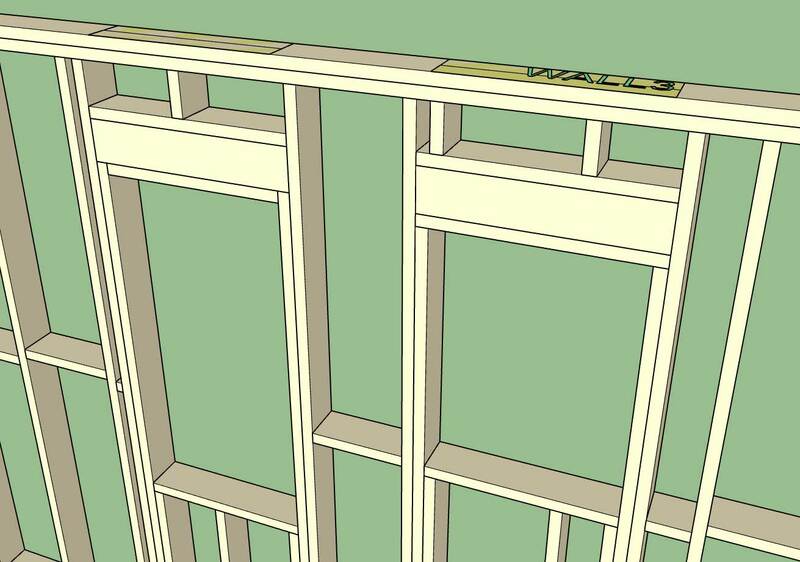 For example a framer or contractor may want framing details with dimensions for each wall panel. The second icon will allow one to export DXF documents for floor plans, roof framing plans, wall framing plans etc... This one is going to be a big project. The third icon will essentially do the same thing as the DXF export function however it will automatically push it out to a PDF document using the built in Ruby Gem (Prawn). Again this will be a big project as well. The DXF and PDF function are rather low on the todo list for now, but I would like to enable the scene generator as soon as possible and after reviewing the applicable sections of the SketchUp API it shouldn't require more than a few lines of code to pull it off.